Tonight was one of those nights I needed dinner to be done at 6 but couldn't spend the time in the afternoon to cook it. So I pulled out the trusty crock-pot and gathered my vegetables that were at the bottom of the drawer. I found a lovely roast in the freezer and got to work this morning. 6 hours later the house smelled amazing and me and my family got to enjoy this lovely (and healthy) beef stew. It was so easy that I may result to doing this once a week. I have picked up a few new tricks after trying some similar recipes and I was really pleased with the result. Sprinkle half of the onion powder, garlic powder, thyme, cumin, salt and pepper on one side of the roast. Place seasoned side down on olive oiled saute pan that is on medium high heat. Sprinkle the other half of the seasoning mixture on the other side of the meat while on the pan. Cook for 3-5 minutes until browned and flip to brown the other side of the meat. Set aside. saute the chopped vegetables in the pan that the meat was just cooked in. After 4-5 minutes add the diced tomatoes, the beef broth and scrape the bottom of the pan to mix together the meat drippings. Pour the broth and vegetables into your crock pot. Place the meat on top of the vegetables and add the cup or so of water to cover the meat with liquid. Add the tsp. of cider vinegar and a sprig of fresh rosemary. 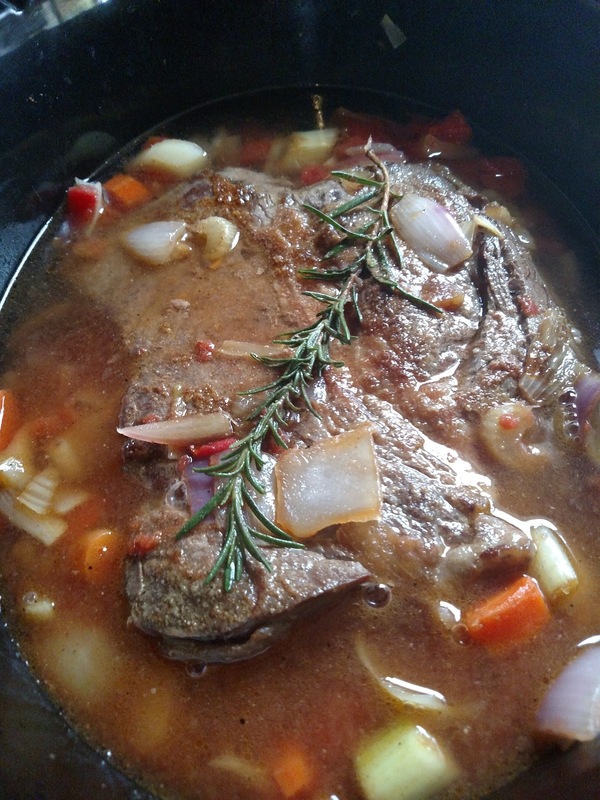 Set crock pot for medium or about 6 hours of cooking time. When finished, shred the beef to the desired size. Discard the stem of the rosemary and season to taste before serving.